A real gas!Thanks for sharing. That might work for you, but I can't run in slippers. 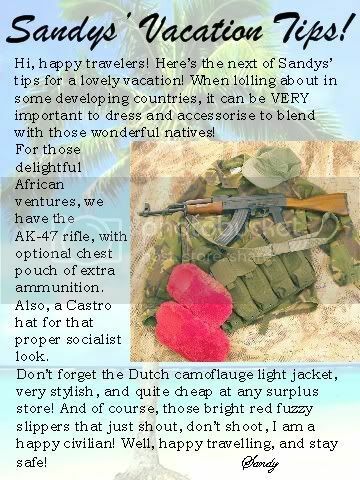 Don't forget the bright red life jacket and feather duster! you think that is bored! a couple of weeks ago i made an entire catalog of firearms that i personally designed on photoshop. it took me 6 hours but it looks like a real firearms company. Maybe you need more practice. I thought Portuguese was the camo of choice. Are those the slippers that allow you to run up walls while vacationing in the third world?